Throughout our lives, we will meet selfish, arrogant, angry and inconsiderate people. We can’t change them but we can decide what part if any, they play in our lives. Unfortunately, children of narcissists do not have that opportunity. The narcissistic parent may have what they see as an ideal relationship with their young child when one looks at the narcissist’s ultimate goal in every relationship, that of total power and control. They write the rule book and the children will comply. The children are seen as a reflection of how they, themselves, wish to be seen. It’s each child’s duty to make mum and dad proud and to set a shining example to the outside world of the perfect child from the perfect family. Nothing is further from the truth. The narcissistic parent will more than likely have an adverse effect on their children. Their children often grow up without knowing what it feels like to be nurtured and loved in a normal way by a normal parent. The controlling parent will ignore their child’s personal boundaries, influencing, manipulating and shaping them into being exactly what they want them to be. However, it is no easy task to fulfill the narcissistic parent’s expectations. Children look to mum and dad to learn behaviour, attitudes, moral principles, emotional attachment and how to treat others. The narcissistic parent’s example is not a good one by any means. As the child grows the controlling parent may feel threatened by their son or daughter’s developing independence. The narcissist has a desperate desire to be ‘needed’ and hates what they see as their loss of control, sometimes turning against their children as a result. There are some narcissistic parents who have no interest in their children at any age. They see their children as nothing more than a burden and a hindrance. Their children’s feelings and emotions are ignored, being told they are overly sensitive if they complain. They will ignore their children’s very existence behind closed doors where only the members of the dysfunctional family will see the reality of family life. The narcissistic parent is difficult to please. Regardless of their children’s achievements, nothing is ever quite good enough. Some children will be constantly criticized, teased and berated with their words and actions being disguised as matters of interest and concern. Comparing their child’s successes with those of their siblings is a subtle put down by which they minimize their son or daughter’s achievements. Some have what is known as a ‘golden child,’ who can do no wrong who will be encouraged to do well and be given the best of everything. The narcissistic parent will celebrate even their most minor achievements whilst their faults and failings are swept under the carpet. This child may receive special treatment for being the perfect child and doing everything that their parent wishes. At the opposite end of the spectrum, there is the scapegoat child who will get blamed for just about everything that goes wrong within the family. They cannot do anything right and their achievements, no matter how great, are ignored or dismissed. The scapegoated child is left in no doubt that they do not mean as much to the narcissistic parent as the golden child. The majority of normal healthy parents want their children to succeed in life. However, the narcissistic parent may have unreasonable expectations way beyond their son or daughter’s capabilities. Their children’s success is a positive reflection on them as a parent. Sadly children of narcissists often grow up carrying the burdens that their parents have bestowed on them. They may have been pushed into the background during their formative years so that mum or dad may take centre stage. They may have been subjected to seemingly endless displays of parental rage. As a result of their traumatic upbringing, children of narcissistic parents often display low self-esteem having been constantly blamed and put down by their parent or parents. Some may bottle up their anger, being unable to express their feelings. They have spent all their childhood trying to please their parent and often grow into people pleasers who do everything to please others. People who are people pleasers often pay too high a price, the cost of their own needs or wants are put on the back burner. 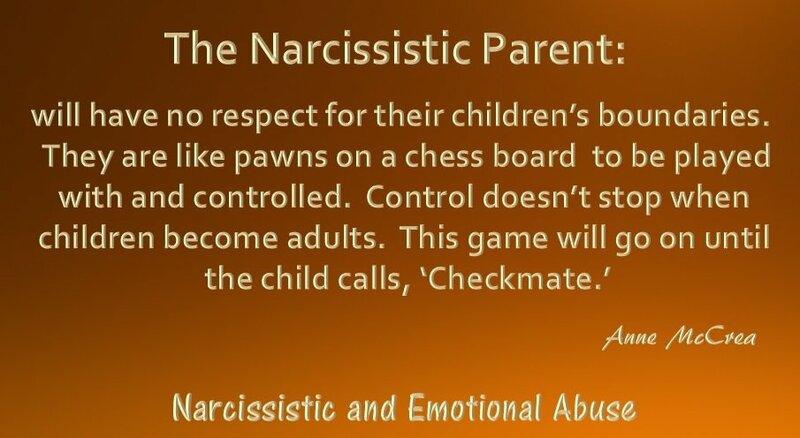 As a child of a narcissistic parent, they were never allowed to stand up for themselves resulting in a strong likelihood that this will continue into their adult lives. 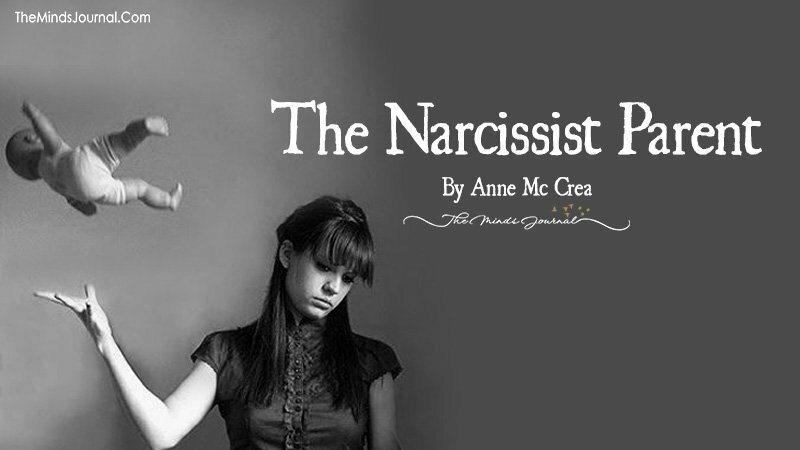 Anne McCrea is the founder of Narcissist and Emotional Abuse.com. Raising awareness and provide information on the subject of narcissistic and emotional abuse. Nope there is no way out!! !